Part of the Industrial Water Equipment Ltd Group. 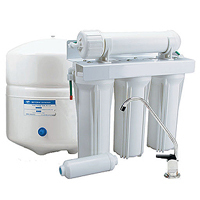 Reverse Osmosis Water is a water treatment website offering domestic reverse osmosis water filters and spares. Please use the navigation to view our range of Domestic and Industrial Reverse Osmosis Systems. Around 2% of water supplied to a household is used for drinking and cooking. Tap water supplied by municipal companies has to be ‘fit for drinking’ and is regulated under law. Even so, tap water varies from region to region, with taste, chemical composition and appearance leading many people to spend extra money on bottled water. Your water contains Chlorine and can have a variety of dissolved minerals and metals, including iron, Nitrates, Chlorides and sodium. The water picks up most of these as it falls as rain on the land, and some (in particular Chlorine) are added by the water companies. Reverse Osmosis is the optimum way to rid water of these impurities. The RO system will remove approximately 95% of the contaminants in water, such as Chlorine, lead, fluorides, bacteria, viruses and unpleasant tastes and odours, and provide you with water ‘as nature intended’ direct from the tap. No more expensive bottled water required! The system works by filtering the water, using mains pressure, through a semi permeable membrane that rejects all the impurities, and flushes them to drain. The pure water is then stored in the tank and provides you with quality water, day or night.